Feeling Tight??? Feeling Sore??? Feeling Restricted??? We understand that flexibility, mobility and stability work hand in hand when we look at human function. This is why we have created small group, 4 week Program, Functional Flexibility. 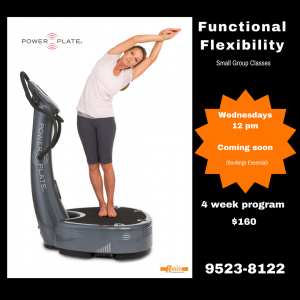 These classes are designed to help YOU move better, feel better and perform better. Using all our knowledge and understanding of Applied Functional Science, we use various strategies and techniques that help us, help YOU optimise YOUR human function, through 3D Functional Flexibility using Power Plate (whole body vibration), TRX, Trigger point, Foam Rollers and Thera-bands. The beauty of performing various movements on Power Plate, is that we are able optimise YOUR results in less time. Classes run for 30 minutes are small groups of 4. Call us or email us for further information. Click on Button below. Payment: $150 upfront, covers the cost of every session for the 6 week Program plus bonuses. The Gladiator Workout – A total body workout following Caroline’s signature “leg-arms-abs” rotation system of circuits interspersed with cardio burners. No muscle goes unused and little rest is required as one body part rests whilst the other is active. 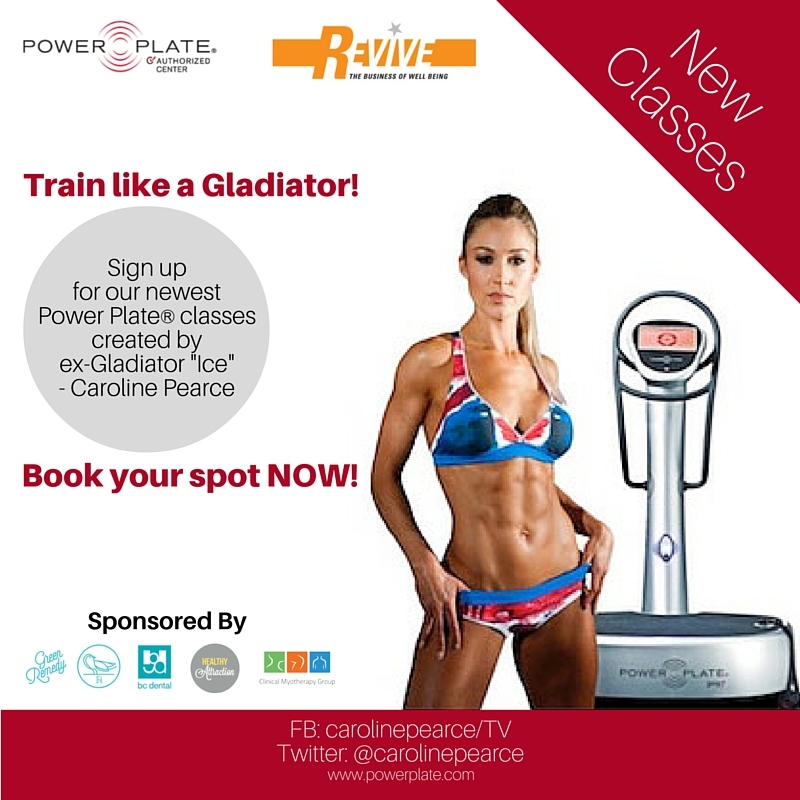 Find out how Caroline gets her Gladiator body with this fast-paced and perfectly balanced exercise class. Train like an MMA Fighter – try this Mixed Martial Arts inspired workout that incorporates boxing, kickboxing, and martial arts conditioning. Work with a partner to hit pads whilst on the Power Plate®, shadow box and level change throughout the workout pushing each other to the max with a mix of cardio and strength based exercises. 360 Degree Abs – Try this unique approach to working your core with a mix of Pilates exercises, loaded core exercises and explosive core work to truly strengthen and shape your core from all angles. As a former international heptathlete Caroline tested her body with 7 grueling disciplines. The key to success in each event came from a stable and strong core and you can follow her training methods in this fun-filled class which focuses on strength, form, function, protection and sculpting the mid section.